From September 2015 to August 2018 the Vienna University of Technology together with six partners in five countries is implementing a strategic partnership in the field of school education. 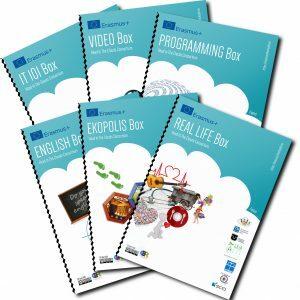 This Erasmus+ project deals with the prevention of early school leaving, the development of basic and transversal skills and the enhancement of digital education in the context of minorities, mainly Roma. Educational disadvantages and exclusion lead to lacking integration in the labour market and exclusion from society in general, which is a vicious circle in minority communities this project wishes to break. 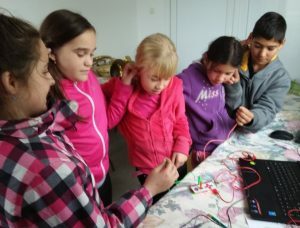 In three locations in Slovakia, Romania and Kosovo the project implements an innovative educational approach to tackle the issue with more than 100 participating children and youth. In their afterschool and youth programmes teachers and youth workers use specifically designed learning materials to engage students and youth in their own learning process. The chosen MINIMAX approach (aiming at minimal teacher invasion and maximum learner autonomy) was originally inspired by the Self-organized Learning Environments (SOLE) approach, a widely recognized alternative educational method that supports an individual learning process according to a student’s abilities, needs and interests as well as the Constructionist learning theory. The project started with a needsassessment to tailor the educational materials to the local contexts and needs. Mentors and youth workers were given the opportunity to experience the accordingly developed tools and materials in the framework of special trainings and subsequently implemented the same with the target groups and evaluated them. The team observes the changes in learning disparities, school attendance, school leaving, pursuit of careers and rise in transversal skills like digital competences. Based on the evaluation tools and materials will be improved and again trained to teachers and youth workers. After the three years the partners working with the target groups directly will continue their implementation of the methods, tools and materials – learning with their children and youth in the clouds. All the pictures displayed on this page and the other pages of brainsintheclouds.eu were taken by the HiC Consortium, if not stated differently, and were made by Andrej Novik, Milica Milović Kinolli, Niina Novak, Klaus Hammermueller, Valerie Weidinger and Szidonia Dulanyi, and published with the consent of the holders of the respective personal rights.